WASHINGTON (April 14, 2016) — Today, Iraq and Afghanistan Veterans of America (IAVA), its members and other veteran service organization partners joined Reps. Seth Moulton (D-Mass. ), Tim Walz (D-Minn.), Brad Ashford (D-Neb. ), Tulsi Gabbard (D-Hawaii), Tammy Duckworth (D-Ill.), Kathleen Rice (D-N.Y.), Gwen Graham (D-Fla.), Julia Brownley (D-Calif.) and Beto O’Rourke (D-Texas) at the U.S. Capitol to urge Congress to defend the Post-9/11 GI Bill from funding cuts. The greatest education investment in our veterans since WWII has recently come under attack with the House passage of H.R.3016, which calls for a 50 percent cut to the housing allowance that children receive if their military or veteran parent transfers the benefit to them. A similar bill (S.425) is making its way to the Senate floor and IAVA is calling on all Members of Congress to pledge to defend the Post-9/11 GI Bill from this and any future cuts to the vital program. 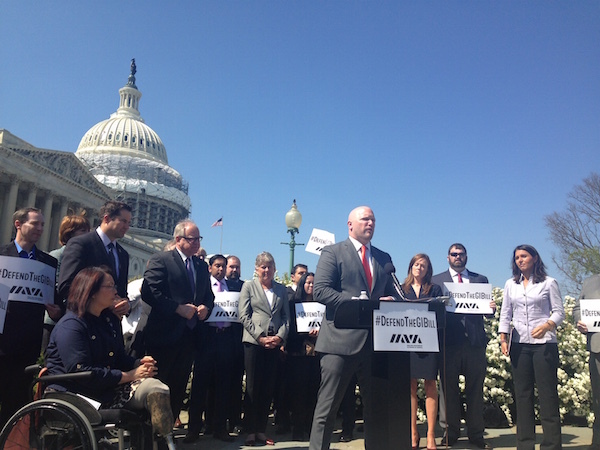 IAVA will oppose the omnibus as a whole and call on the president to veto the bill if it is passed with the cuts intact. IAVA was joined at the press conference by veteran and military service organizations representing a diverse cross section of community of those who have served, including Vietnam Veterans of America (VVA), Air Force Sergeants Association (AFSA), Association of the United States Navy (AUSN) and Commissioned Officers Association (COA). “Vietnam Veterans of America has long held that government should never pay for a program for one group of veterans by cutting funding and taking away from any other group of veterans. Robbing Peter to pay Paul, no matter how important or vital Paul might be, goes against one of VVA’s core principles,” said Rick Weidman, VVA Executive Director for Policy and Government Affairs. “Officers in the U.S. Public Health Service fought hard to be allowed to transfer GI Bill benefits to their dependents. Because these officers have one or more college degrees when they join the USPHS, they don’t tend to use the bill’s provisions for themselves as much as do members of other services. Transferability means everything to them, and this proposed legislation would take some of that benefit from them,” said Col. (ret.) James T. Currie, Executive Director for Commissioned Officers Association of the U.S. Public Health Service. Since IAVA launched the #DefendTheGIBill campaign in March 2016, IAVA members have sent nearly 14,000 letters to Congress asking representatives to oppose any cuts to the Post-9/11 GI Bill. In addition, every Member of Congress has been challenged to take the pledge to defend the Post-9/11 GI Bill. The Post-9/11 GI Bill has been used by nearly one million veterans and their family members to accomplish educational goals and chart new career paths.